The Scrambler’s story starts with the Bialbero Corsa Corta, a very special engine that now powers every single one of these Italian bikes. The 1,187 cc engine has four valves for each of its two cylinders. The cylinders are mounted in an 87 degree-V that fills the hydroformed chassis completely. 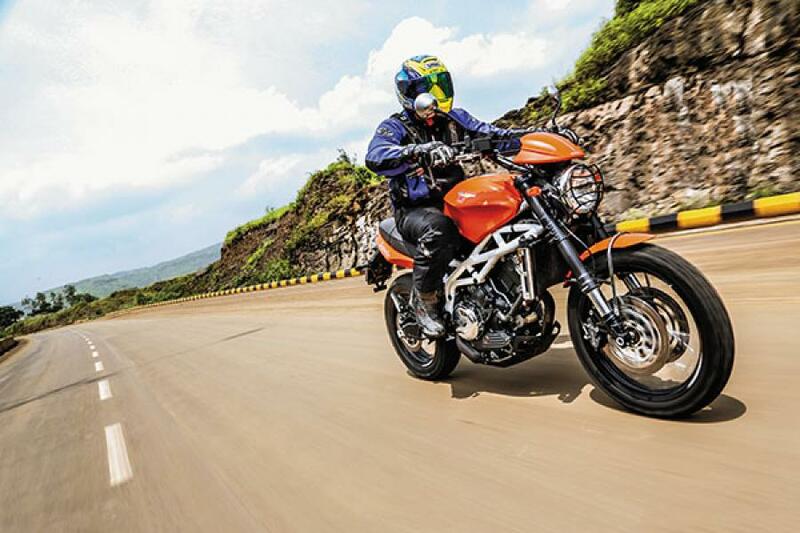 On a motorcycle geared for 200 kmph, this means the flow of torque has no beginning and no end. The first thing you notice is its weight: 200 kg. Then, you realise that the top edge of the tank is roughly the same height as your sternum. The bike may have new technology like a slipper clutch, but this is an old-school bike: There are no electronics waiting to turn defeat into heroic riding. 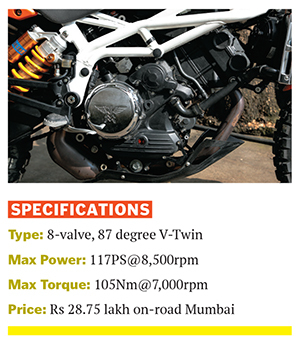 If you think of yourself as a sort of Wolverine-type person, this is the motorcycle you should be riding. I find an empty road and wind the throttle to the stop almost squinting in anticipation of what is about to happen. The engine goes absolutely berserk. The exhaust isn’t particularly subtle. But with the throttle opened suddenly, the induction roar is intense and lovely in a very raw sort of way. The connection from the throttle to thrust is immediate, instant and transparent. It’s so sensitive that if you flex your forearm, you can usually produce an attendant change of speed. On our less-than-perfect roads, there is the real danger that you’ll arm-pump yourself just trying to hold a steady speed. But when you wind it on, the Scrambler is electric. All these fun and games are scary and titillating until you feel the motorcycle going into a steady weave around 160 kmph. You’ll realise that the weave is probably a result of riding the bike with the standard knobby tyres; the optional street tyres are actually rated for the bike’s top speed while these knobbies aren’t. The quality of the switchgear is indifferent as is the generic instrument cluster that I think can stand a little more detail work. There are Marzocchi forks up front, Paioli makes the standard rear shock absorbers, while our test bike came with optional, adjustable Ohlins, Brembo for the brakes, Excel for the rims. The Scrambler is the anti-establishment machine. It’s a brand that in India doesn’t have significant cachet. It’s extremely expensive. If you don’t want a motorcycle just like the one everyone else has, look no further. Just remember you’ll probably need to work out before you go for a grapple with the Scrambler.